Back in the 70s, the very late 70s that is, I was a freshman at St. Peter's Prep in Jersey City, NJ. Before starting school, my mother bought me oxford cloth shirts in every color and one of my favorite things about them was the "locker loop" on the shirt's back, which allowed you to hang a shirt in your gym locker neatly. (There was a strict dress code and a wrinkled shirt could easily land you in detention.) But, of course, they never lasted long. Locker loops, also known as "fruit loops," were also popular with upperclassmen. They'd yank you by them in the hallway until there was only a strip of fabric dangling from one side of your shirt. 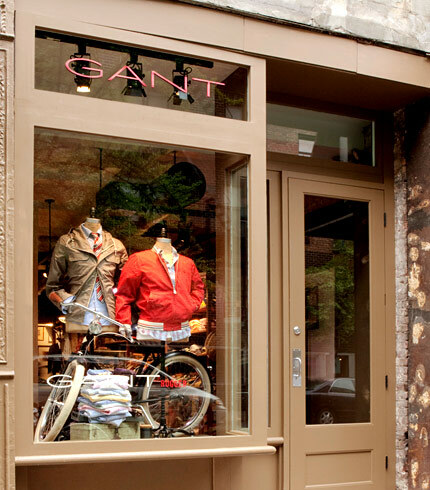 Locker loops, washed madras and old school blazers are a few of the vintage-esque things that you'll find in the first Gant Rugger store, opening today in New York's West Village. Though only 700 square feet, the shop's filled with the entire Rugger line. Designed by Christopher Bastin—you'd never guess the designer's a native of Sweden—the spring line is 100% grade-A American sportswear. Retro for sure, but not in a costume-y way, more of a "I had that when I was younger and wish I still had it" way. Bastin, who worked for Acne and H&M before joining Gant in 2005, can't help telling stories about every element as he walks me through the store. The brass buttons on the blazers are 30 years old—archival Gant stock he found rummaging through a dusty storage room. The store's shopping bags are made from kraft paper, modeled after grocery bags and before he lets me see it, Bastin has to crumple it in his hand to get what he calls "the perfect roll." It's the same expertly disheveled roll he applies to some of the clothes as we look through the racks. No detail is spared. The wire hangers that are interspersed with reclaimed wooden ones? They're from Sweden. Bastin tells me, "They are slightly heavier and sturdier than the ones here in the US" and you know what? He's right and it makes all the difference. Designer Christopher Bastin is the embodiment of the Rugger brand in this season's navy hopsack blazer, $495, with a T-shirt and jeans. The dressing room pays homage to the label's founder, Bernard Gant. It's made up to look like his factory floor office. The yellow "Hugger" oxford, the slimmest cut shirt in the line, was one of my favorites. It's cut from selvage oxford cloth but what got me was the color. Not that sickly "corn chowder" yellow that button-downs usually come in, this bright shade actually makes you look tanner, thinner and at $110, richer. Lightweight cotton madras shirts, $125, feature a pin-up girl stitched under the cuff for a literal trick up your sleeve. A belt, $55, that Bastin based on a vintage pair of suspenders he found. With a red, white and blue graphic down-hill skier, it's not what you'd expect for spring/summer, but makes for a really cool surprise. The adjustable wood shelving system is based on the company's manufacturing factories in New Haven, CT. The limited edition single-speed cruiser bicycle, $995—a favorite when the spring line was unveiled—complete with hand-stitched leather handlebar grips and a Brooks saddle. Original framed newspaper articles, calendars and pictures were brought over from the factory floors of the old New Haven foundry. The behind-the-scenes story of how the Michael Bastian for Gant collection came together, from the mouth of Bastian himself. Six archival shirts have been modernized for the company's anniversary including an innovative oxford pullover and a cashmere flannel. J.Crew's CEO on turning around the company, men's love of lore and how the store's popular collaborations came about. 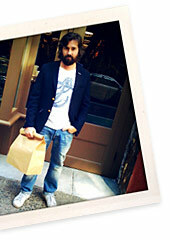 Save Khaki's David Mullen relaunches the '80s shirt label B.D. Baggies for the modern man.